Optimum protection against harmful gases. Protection against harmful gases is of paramount importance when preparing paint and paint jobs. The Tander Disposable Spray Mask is supplied with A1 filters, while compliance with various EN standards make it the perfect choice. 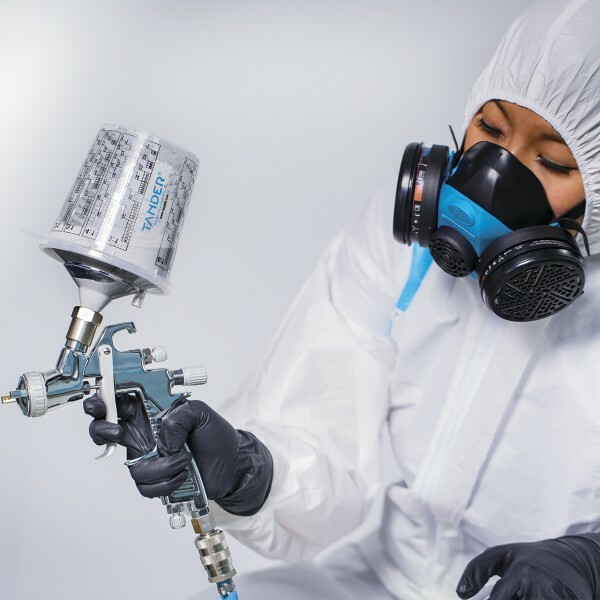 The mask has a tight, comfortable and adjustable fit around the nose and mouth and protects you from harmful paint and solvent vapours for up to 40 hours. Protecting yourself from harmful vapours is of paramount importance. That's why craftsmen choose the Tander Disposable Spray Mask for optimum protection. After 40 working hours, the complete respirator has to be replaced by a new version. After 40 working hours, the complete respirator has to be replaced by a new version. ; Protection is limited to the mouth and nose only. Please combine with additional personal protective equipment for full protection. Filter Type Two active carbon filters. Filter class A1. How long can this mask be used? The Tander Disposable Spray Mask should be replaced after 40 working hours. What does A1 protection stand for? The Tander Disposable Spray Mask consists of A1 filters. The A1 filter offers protection from organic gases and vapors with boiling point > 65ºC. How can I determine the fit of this Spray Mask? The Tander Spray Mask has a tight, comfortable and adjustable fit around the nose and mouth. Thanks to its adjustable strips the Spray Mask offers a custom comfortable fit.